Madison Union annually becomes the Disneyworld of JMU during its open house, minus the crowds and long lines. This year’s, held on September 20, was filled with a variety of finger-foods, giveaways, music, and more. Students excitedly explored each floor, some exclaiming “are these free,” or grabbing food and sitting with their friends in areas like the Airport Lounge on the 4th floor loft. Students passed by each organization, picking up flyers and grazing on the finger-foods. Many talked excitedly with members over their mac n’ cheese bites and paw brownies. Attendees took advantage of the chance to learn more about Madison Union as they were fed their free lunches. Collaboration efforts were apparent throughout the building, even in TDU, a floor without any student organization offices. The fun kept going down there with a talented, as usual, indie-rock duo called Illiterate Light playing as people colored and enjoyed the music. And even though dining places like Auntie Anne’s usually separate themselves from school events, they chose to hand out different free samples, including their seasonal pumpkin spice nuggets. 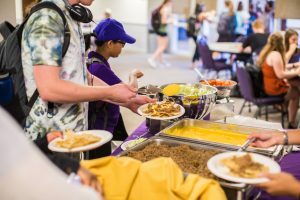 Students enjoying the nacho station, taken for JMU Technology & Design by Tommy Koehler. All rights reserved. No usage without permission. As attendees of the open house walked upstairs to the second floor, the smell of more free food and sounds of socializing and an EDM DJ wafted towards them. Popcorn, chip clips, and stylin’ Madison Union fanny-packs were handed out outside the Technology & Design office, and the smell of soft pretzels and mini corndogs drew people into the Center for Multicultural Student Services. Once everyone stuffed the headphones, water bottles, flyers, and Hispanic Heritage Month calendars into their bags, they headed over to the picture-perfect nachos, which were the favorite of many people like freshman communications major Anna Connole, in MU 256. There they also found coloring stations serenaded by the DJ, senior English major Michael Khalifeh. Guitarist Nic Maoury, taken for JMU Technology & Design by Tommy Koehler. All rights reserved. No usage without permission. Although no other T-shirts were being given away, the third floor was filled with even more food, giveaways, and entertainment. Cheese, juice, and other drinks sat near the entrance of the third floor along with body airbrushing and a guitarist on the loft stairs. Denne came to the open house after remembering last year’s and immediately went to the airbrushing station. “I like that you guys put this on every year,” she said. 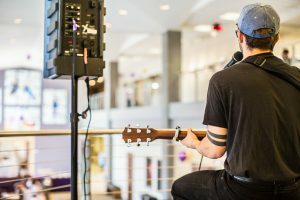 As far as the musician, everyone in the vicinity enjoyed sophomore computer science major Nic Maoury’s style and clapped for him on occasion. “I like the entertainment,” freshman biology major Emily Thompson commented, referring to Nic.